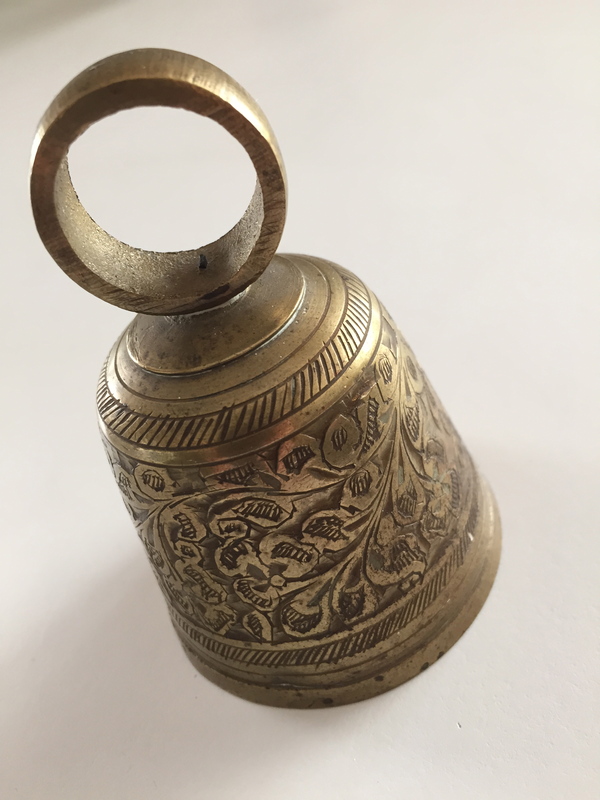 I recently found this great, brass bell from a Polynesian Island, at a garage sale. I immediately remembered something I had read from Richard Carlson about “A Golden Pause.” I knew I had to have it to remind myself to take moments and pause. I ring it and listen to the ding and something soothing does happen. It not only makes me smile, but stopping to pause and listen to a ding, a simple ring, makes you take a moment. These pauses, which took place approximately every hour and a half or so, lasted five or ten minutes and were wonderfully received by everyone in the room. First, a pleasant little bell would ring, signaling the beginning of the break. All at once, everyone in the room — hundreds of us — became suddenly calm. We ceased all conversation and dropped everything we were doing. We were instructed to sit in comfortable positions and to simply relax. It was a time to be still, quiet and calm–a time just to appreciate about the fact that we were alive. Our only remaining instructions were to breathe and to focus on the beauty of the breath. Whenever Kris and I go to a workshop, we try to take something with us that will hopefully stay with us forever. The idea of Golden Pauses has stuck like Velcro! We have found that Golden Pauses have the power to make the most impossible day manageable, giving us the perspective we need to get through it. Many times, I have been angry or irritated at someone on returning home from a long plane trip or just feeling beat up and tired and Kris will smile at me and say that it’s time for a Golden Pause. We “pause” for just a few minutes, but this little break invariably interrupts my negative thinking and readjusts my mental attitude. It’s such a simple, yet powerful way to change the course of a day. A Golden Pause takes any day you feel tired or irritated day and infuses it with positive energy. For me, it’s a plane trip that can put me in a bad mood, for others I know it’s a long commute, or a hard day at the office. A five-minute Golden Pause (or even a two-minute pause if that’s all the time you have) usually reverses all of that negativity and then some. But you don’t have to be tired or irritated to benefit. A Golden Pause can even make a day that’s already wonderful even more glorious! Often, Kris and I are having a completely peaceful day already yet one of us will suggest a Golden Pause just to “remember” and appreciate the joy we are feeling. The pause reinforces and deepens feelings we are already having. I once mentioned the concept of Golden Pauses during a lecture on the East Coast. Several months later, I met a man at another lecture in Las Vegas who had been in the East Coast audience that day. Steve came up to say hello after my speaking engagement in Las Vegas and shared with me the following story. Steve referred to himself as having been an “over-reactive hot head.” During a particularly stressful period of time in his business, someone took advantage of the lack of business experience on the part of one of Steve’s employees. He said that when this happened, he was about to “lose it.” I asked him what “losing it” was likely to mean for him. Steve explained that it may have meant a physical fight, a lawsuit, or a very least, a huge embarrassing scene in front of lots of people. But in that moment of great stress, he said, some part of him suddenly remembered the notion of the “Golden Pause.” Why he chose this instant to give it a try, we’ll never know, but he did! Instead of losing it that day, Steve imagined a tiny bell ringing, signaling the beginning of a Golden Pause. He sat down comfortably and began paying attention to all that he had to be grateful for. His mind became clear of negativity. His body relaxed and he felt calmer. He started to breathe in and out several times and to appreciate the gift of breath. According to Steve, the entire Golden Pause went on for about 5 minutes, at which time he imagined a bell ringing again to signal the end of the break. When it was over, he said, his body language was entirely different. He was relaxed and calm. The furthest thing from his mind was to fight with or sue someone. I often practice a Golden Pause several times a day, usually when the day seems to be speeding up too quickly or when life seems to be wired too tightly, but often when things are going just fine, too. Golden Pauses have a way of transforming my relationship to the world. Once the pause is over, I see the world and everyone in it quite differently. It’s like stepping into a temporary place of euphoria where everything is more peaceful. When you step out, much of the benefit stays with you. A Golden Pause might take only a few minutes of your time — five to ten minutes at absolute tops — but the change in you will be substantial, quantifiable and lasting. So give the Golden Pause technique a try. It’s easy to implement, very relaxing, and can be done virtually anywhere. They only take a few minutes, yet Golden Pauses alter your entire perspective on life, teaching you the value and wisdom of a calm, quiet mind. Golden Pauses are one of the highlights of my day. I hope they will become so for you as well. In fact, why not begin right now? Ding! So, when you find a little golden bell–buy it & create a special space to invite “A Golden Pause” moment.